The Ojai Music Festival is fortunate to be part of a strong community of residents and businesses supporting the arts in the Ojai Valley. 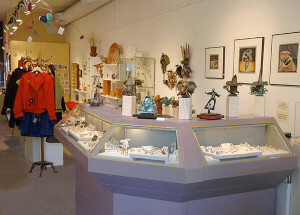 One of our longtime friends is HumanArts Gallery located in the downtown Arcade. Owners Hallie and Stan Katz share their story of how intertwined the Festival is with their move to Ojai. It was May 30, 1975 and most of the action was in Libbey Park where Michael Tilson Thomas was preparing to conduct the Ojai Music Festival. In a much smaller venue across the street there was another buzz happening — a new gallery in town was hosting its grand opening –- it was one of the only galleries in town at that time! Three couples, fairly new to town, decided to show an eclectic mix of pottery, jewelry, paintings, and sculpture, some of which they themselves made. Truly one of the first places dedicated to contemporary fine craft in Southern California, it was known then as Running Ridge Gallery. The original partners were Bob and Barbara Grabowski, Bob’s sister Ruth Farnham and her husband John, and Jett and Sharon Spencer. Bob, Jett, and Sharon made jewelry; Ruth was a painter; and John was a sculptor. Barbara was the business manager. 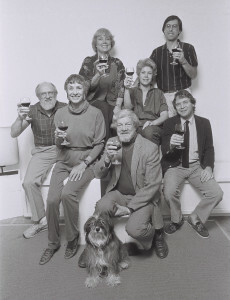 Ojai and the patrons of the Music Festival that year welcomed the new little gallery and it hummed along nicely for five years until the Spencers wanted to leave Ojai. 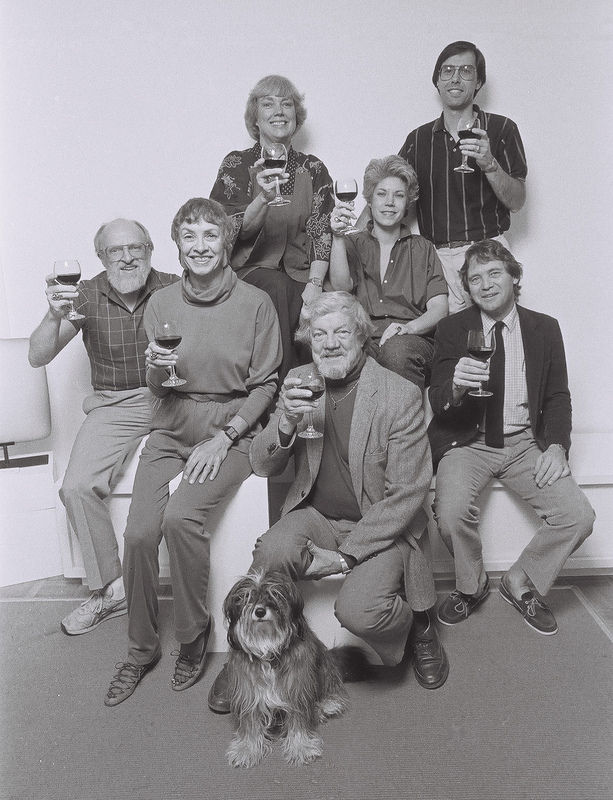 Good friends of the partners from LA, Hallie and Stan Katz, were asked if they would like to move to Ojai and join in this endeavor, taking the Spencers’ place. 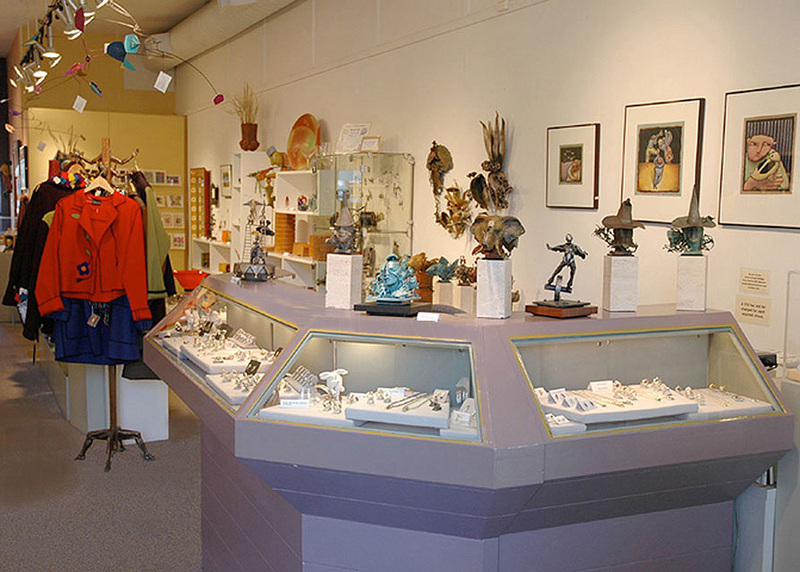 Hallie and Stan owned a jewelry school and gallery on Ventura Boulevard in Studio City, and they were ready for a quieter life style with more focus on the gallery business and designing their own jewelry. So this was a good move, as it gave them more freedom to exhibit in shows around the country, taking turns with partners to run the shop. It was a very successful partnership for ten more years, and then the Grabowski’s wanted to move to Idaho. Ruth and John were ready to get out of the ‘retail’ game. So Hallie and Stan bought out the partners in 1990, and changed the name to HumanArts Gallery. The rest is history, as they say. Fast forward to the present – it’s coming up on June 2015 and Hallie and Stan are celebrating the 40th year of the gallery’s presence on Ojai Avenue, the anniversary falling at the same time as the Ojai Music Festival kicks off each year. 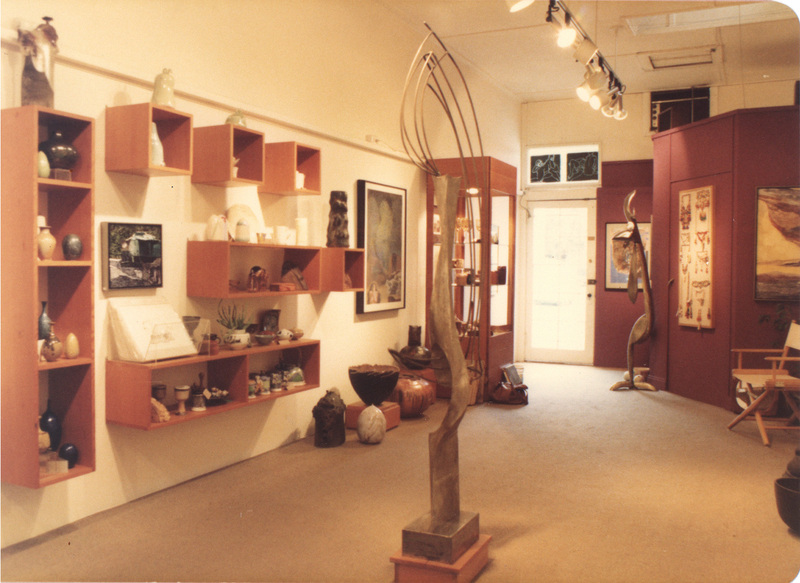 The Gallery resided in its original building on the Arcade walk-through until 2008, when it moved to a much bigger space eight doors west, directly across from Libbey Park. Incorporating handmade furniture and home accessories, Stan and Hallie now represent about 150 artists from all over the U.S., including 20 who are local. HumanArts has become an arts destination for many loyal fans, the first stop for many when they arrive in town. 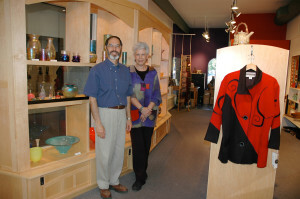 It’s also on the radar for local supporters when they need a gift or an especially artful treat for themselves. Hallie continues to make custom jewelry, mostly unique wedding rings, and Stan oversees the running of the shop. You can still find them there on the weekends to welcome you and tell stories about the many wonderful artists they represent and how Ojai is still the same paradise they discovered all those years ago. I love HumanArts Hallie and Stan. It’s my favorite. Congratulations! MAZAL TOV!!!!!! It’s hard to believe it’s 40 years. You are both amazing. I can’t bebieve it’s been this long. You guys are great Thanks for all you do. Ojai is a better place because you’re here. Happy Anniversary! You two keep this town happening! Thank you! Great people, doing great things in a really great place. Brings back some great memories. Congratulations! Love you guys! Amazing!!! Congratulations! I remember the 30th year anniversary. The 50th year will be here before you know it. 🙂 Thank you for giving us an education of all the wonderful crafts in the world so we have a better appreciation. It’s been great knowing you all of these years! As another jewelry store owner in Ventura, there hasn’t been a competitive feeling–in fact I’ve enjoyed bouncing ideas off of you from time to time. Here’s to many more years!